Community Board #1’s “war on brunch” has now officially became news last week, having been picked up by both WNYC and the New York Times. Credit for originating the story belongs to Aaron Short at the Brooklyn Paper. Too bad they let a catchy headline distract them from the real story (and no, it’s not about gentrification, though that’s a catchy headline too). The big story here is that the “war on brunch” is really a crackdown on street life. The Community Board, upset at a few bars and restaurants, has chosen to use a hatchet instead of a scalpel. Restaurants and property owners are getting summonses and warning letters about sidewalk benches, sidewalk planters and the like1. As with dining al fresco before noon on Sundays, these targets of the Community Board’s ire are actually the kinds of things that make a neighborhood more livable and more enjoyable. There is a reason why city planners obsess over things like bench heights, and it goes all the way back to the great neighborhood advocate Jane Jacobs herself. Street life, be it seniors sitting on a bench or patrons waiting for a seat at an insanely popular restaurant, makes for better neighborhoods and better communities (or, as Holly Whyte put it, you can measure the health of a city by the vitality of its streets). Outlawing benches and planters isn’t going to make Pies ‘n’ Thighs any less popular (or any less good), though it will mean that more people – not less – are standing around waiting for a table and clogging up the sidewalk. To be clear, all this wonderful street furniture is also illegal. But using laws against sidewalk furniture to go after a broad swath of businesses is a stop-and-frisk approach to a very specific problem. If the problem is that certain restaurants are flouting the laws about sidewalk cafes and creating an actual nuisance, go after those restaurants. If neighbors have specific complaints, the Community Board should (and traditionally has) acted as a broker, talking to the owners and the residents to work out a solution. If that doesn’t work, then use the relevant city agencies to crack down on the specific troublemaker. In the long run, trotting out arcane, outdated blue laws is not an effective approach, if for no other reason than that it turns the target into a victim and the enforcer into a bully. 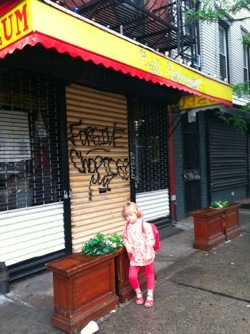 The story now is not that some number of restaurant owners are breaking the law and creating a community nuisance, but rather that the Community Board, through City agencies, is using outmoded, ticky-tacky laws to bully a whole business sector (and in the process sweeping in private citizens who have rogue planters, benches and other contraband street furniture (lawns!!) in front of their houses). Ironically, the perennially bad neighbors on the nightlife scene haven’t been impacted by the crackdown, and may not be – most of their sidewalk cafes are legal, and they don’t open before noon on any day. 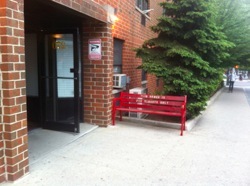 A nice place for seniors to sit or a public nuisance? In other developments, Councilman Steve Levin is promising to introduce legislation to rescind the ridiculous prohibition on sidewalk eateries before noon on Sundays. Given that many of the neighborhood clergy – including Ann Kansfield of Greenpoint Reformed Church and Monsignor Calise of Our Lady of Mt. Carmel (and a member of CB1) – have gone on record saying that Sunday morning eateries are not a threat to their religious observance, this is a good thing. Hopefully cooler heads will prevail on the bigger issue of the street furniture crackdown too. I agree this is issue is more about peaceably sharing sidewalks and making our neighborhood feel like home. I can’t believe that the Community Board Chair, Christopher Olechowski, thinks he can be an effective district leader when he can’t even control one board committee’s outrageous position. Where’s that leadership? By not taking the reins firmly in hand at the community board, which he’s supposed to be leading, Olechowski has contributed to phenomenal ill will in the community. Is this the kind of district leader he’ll be? Is this how little he cares about infighting in the community? He’s remained on the sidelines watching things get blown out of proportion while doing nothing to promote a positive outcome. Ideas? None. Action? None. Leadership? None. He’s all talk and no kielbasa.